Another set by this wonderful branch of building toys. 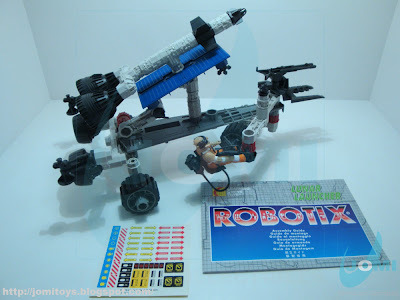 An action figure favorite, Robotix. 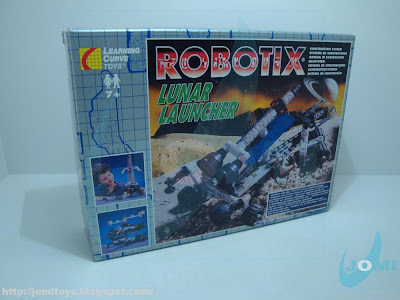 The 1996 Lunar Launcher. 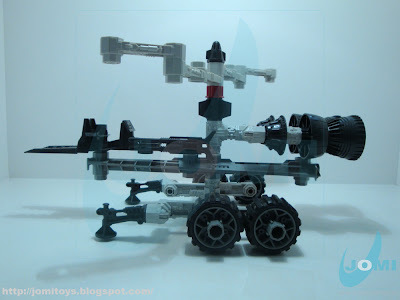 Much like the Space World Lego sets, but weaponized. And A LOT bigger. Contents view, with unapplied stickers. 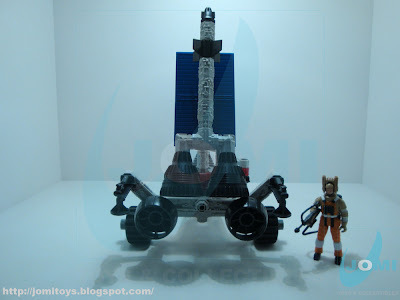 The rocket launcher platform moves 90º to launch. 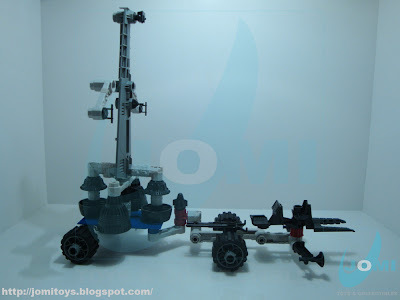 Rear view and space scout figure, fully equipped. The engine exhausts are one of the most realistic features. All 4 views. Apart from the engine exhausts, I found the stabilizers, solar panels (here serving as platform) and tires, some of the most fascinating parts included. 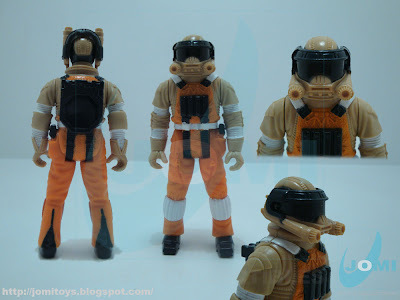 The figure: "Space Scout". 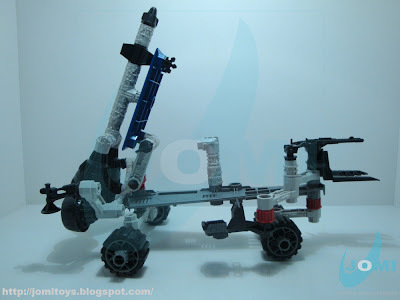 Present in 50% of all Robotix sets (apart from the educational side of the brand), the Scout is a basic action figure with arms and legs movement articulation points. 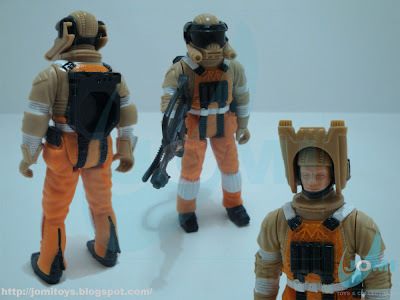 Although "Lt Denver" (Robotix WASP) seemed to be made out of PVC, these "orange and beige" scouts seem to be made out of a different matter. Or a mix in between. About the figure´s face, there is a certain resemblance to Keir Dullea and his character "Dave Bowman" featured in Stanley Kubricks´s "2001: A Space Odyssey"... and "2010", of course. The detail of its sculpting is far better than the articulation it was presented with. In an era where produced and distributed action figures ranged from poor to excellent, this stands in the middle. It has the basics. And it works. So, can´t go too wrong there. Another possible assembly: Jet Copter. 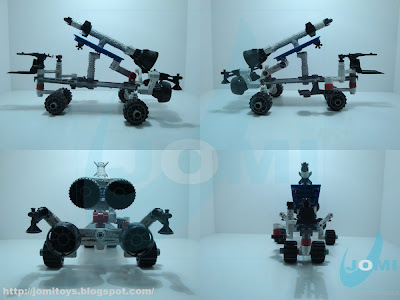 Mars Explorer. 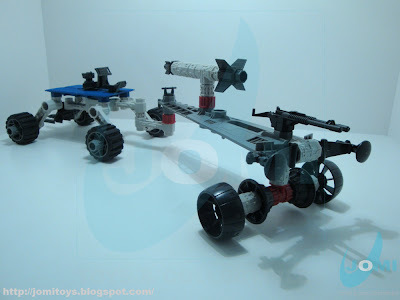 Not the "Mars Exploration Rover" modeled after NASA´s buggy (also from Robotix). 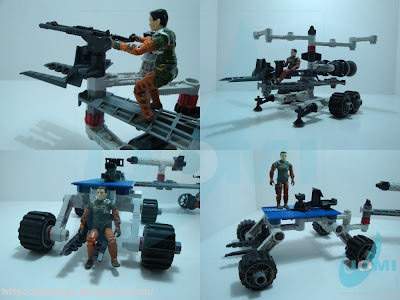 Scale shots with a G.I.Joe RAH action figure. You know those crazy Cobra Commander plans with space, deep sea or underground command centres? With these sets, you can actually replicate some of those moments. 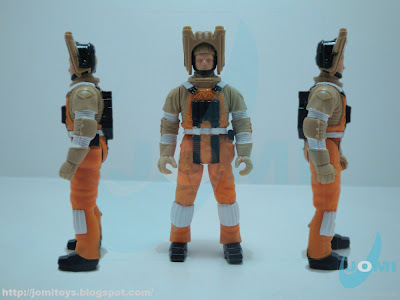 Maybe I'm just a child of the 80's, but I was almost certain the orange and brown "Space Scout" figure (originally included with the series ONE bad guy, Tyrannix) was most certainly meant to represent a Russian Cosmonaut, in opposition to the definitely US looking astronauts included in other sets. They are. Send me an email and I´ll get you a supersized pictured with more detail.